With the publication of the Greater Sydney Region Plan, A Metropolis of Three Cities and the five District Plans in March 2018, the clock has started for councils to complete work on the many Priorities and Actions outlined in both strategic planning documents. With a deadline of 3 years from March 2018 (or 2 years for 18 councils who are the recipients of $2.5 million in funding from the NSW Government) councils are expected to have completed an update of their Local Environmental Plan which will incorporate and reflect the strategic directions of the Region and their District. However, to get to an updated LEP, there are three significant steps comprised of statutory requirements, strategic studies and stakeholder engagements that councils will need to undertake and complete. Each of these steps must progressed in a reasonable time in order to meet the delivery requirements set out by the Greater Sydney Commission and the Department of Planning and Environment. Below are the broad steps involved and the time in which they are to be completed. These three stages are outlined below. This Priority, within each district plan, contains an Action that requires council to perform a review of their LEP including a gap analysis against the Priorities and Actions of the region and their district plan, as well as identifying any barriers to giving effect to these plans. This step also requires councils to undertake an analysis of local context by considering the social, economic and environmental dimensions of their communities, reflect upon the priorities of community strategic plans and identify areas of State, Regional or District significance. 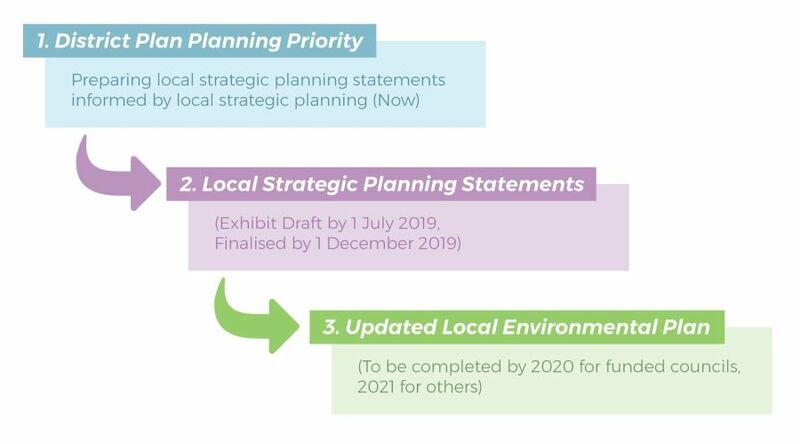 Upon the conclusion of this review councils are to report on their findings and recommendations for local strategic planning priorities that will inform Local Strategic Planning Statements (LSPS) and LEP updates. Completing this action will provide a scope and background information for the LSPS work program. Local Strategic Planning Statements were introduced through an amendment to the Environmental Planning and Assessment Act 1979 in March 2018. As statutory requirement, councils are to prepare, implement and, in time, review their LSPS. The LSPS is considered to be part of the hierarchy of strategic planning instruments that will continually inform and be informed by the suite of strategic plans in NSW. The figure below demonstrates the feedback loop of these strategies, with the intention that the LSPS will inform the review of regional and district planning as well as the bottom-up influence of Community Strategic Plans on the LSPS. Image Source: Local Strategic Planning Statements – Guideline for Councils, Department of Planning and Environment 2018. The LSPS will communicate to residents a 20-year vision for an LGA, outlining the values and characteristics that contribute to local identity. It is through the LSPS that councils will outline how these values will be maintained and enhanced and how growth will be managed. The LSPS will also outline how it will give effect to the Priorities and Actions of the regional and district plan and detail council’s planning priorities that will inform the updating of their LEPs. In terms of their scope a LSPS could be considered a localised district plan that details how Actions will be implemented. The LSPS is developed over four-stages, with several component parts. These steps and parts are detailed below. Scoping Stage – Councils should ideally commence as soon as possible. This stage will benefit from the outcomes of the strategic planning review required by the Action within District Planning Priority – Preparing local strategic planning statements informed by local strategic planning. Developing a preliminary list of planning priorities. Testing Stage – This stage requires the development, testing and refinement of outcomes of scoping stage including the vision and priorities. A number of different development options or growth scenarios may be included. Preparation of a draft LSPS for exhibition. Finalisation Stage – At this stage councils may develop supporting material to explain priorities, options considered and reasons for final choices. Implementation Stage – Implementation will involve an ongoing program of works, and a review every seven years once made. Monitoring and review of the LSPS to respond to changes such as infrastructure investment or demographic shifts. Development of a monitoring system and dashboard. Environmental Planning and Assessment (Savings, Transitional and Other Provisions) Regulation 2017 require councils to exhibit their draft LSPS by 1 July 2019 with the final version adopted by 1 December. Regional councils are given an allowance of an additional year with final submission at 1 July 2020. Once an LSPS is finalised and adopted by Council, work to update LEP will begin. This will involve translating the vision and planning priorities of the LSPS into the LEP through changes to LEP mapping, controls and the written instrument. The NSW Government is supporting several councils to update their LEPs through $2.5 million in funding for strategic planning. In accepting this support, councils are obliged to complete their LEP updates by March 2020. Councils who have received funding so far are Camden, Campbelltown, Canada Bay, Canterbury-Bankstown, Cumberland, Fairfield, Hornsby, Inner West, Liverpool, Parramatta, Penrith Ryde and Wollondilly. The GSC have invited the remaining 20 councils to apply for five additional grants of $2.5 million by 25 June 2018. The successful applicants are yet to be determined. The requirements for the strategic review of LEPs, the development of the LSPS and updating of an LEP means there is a significant volume of strategic planning work for councils to complete from in a relatively short time. With these delivery timeframes, councils will need to ensure strategic planning is co-ordinated and managed appropriately and that investigations and studies are both thorough and efficient to meet statutory requirements. However this is approached, councils will need the support of State agencies and the input of planning consultants to meet these timeframes and delivery a satisfactory comprehensive strategic planning outcome for their communities. Article written by Jeremy Dwyer.